Sometimes, when reviewing products there comes that special one that knocks your socks off-in this case literally. 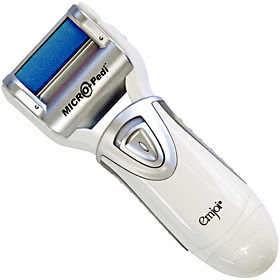 Gerry and I have recently reviewed Micro Pedi, which is a special micro mineral roller that spins around itself removing layers of dirt and hard skin. There are a few versions available, and we tried the MICRO Pedi Manicure/Pedicure Kit, requiring two AA batteries. It has been one of the best products we have tried in a while. The rollers are not rough on your skin and work very easily. Once you put on the lotion your feet feel super smooth. The rollers would have to be replaced depending on usage. For example athletes or people who spend a lot of their time on their feet may have to replace the rollers a little more often than the general public. We were very excited to try the product and we highly recommend it to all. ** See demo video here. Update: Although I loved this product, I quickly found out the rollers didn't last long, and dulled out. As well, refills were two for $19.95 plus shipping that was quite expensive. So although the product is a good product, keep in mind refills are expensive- even on Ebay! The Micro Pedi is AWESOME. In the winter months, I quickly develop cracked heels quite severely. I see many cracks on each heel and some at the top of the foot. This product simply put, WORKS. I am throwing out all the other "loser" products i have tried unsuccessfully. You won't believe this until you try it yourself but the product is well worth the money. on the first time using it, my feet were smoothed down. I have been using it daily during my first week until the cracks totally disappear. I cannot be more excited that I found this product. It is such a blessing. I plan to tell my podiatrist about this product. I wish I had taken before and after pictures.